The current HO layout, a TKO routed track, debuted in 2010. 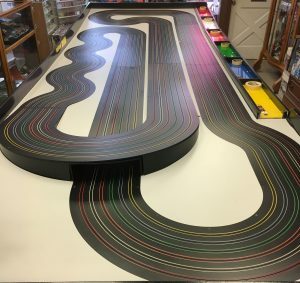 It replaced a 6-lane Tomy AFX layout that had occupied the same table since 2005, when it replaced the vintage Aurora Tub (ultimately refitted with Tomy AFX track) that had been NJ Nostalgia Hobby’s original racing layout since 1990. New for 2014 is a routed 4 lane layout on MDF (medium density fiberboard). The advantage of the routed track is the lack of joints every few inches, thus providing a smoother driving experience. This layout provides power through magnetic braid which provides about 70% of the down force of steel rail. New for the 2012-2013 race season. 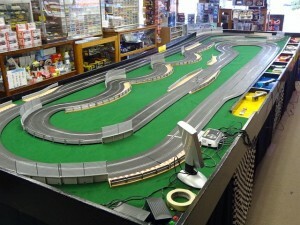 This track was fairly easy for us to put on top of the existing 1/32 Scalextric Analog track. 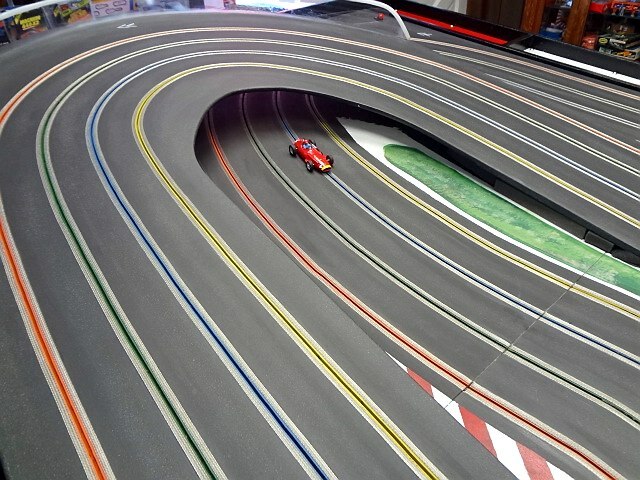 We covered the analog track with a 5 ½ foot by 16 foot long single piece of green felt and constructed this digital layout using the Scalextric 6 car power base. The layout for the digital track mimics the analog track but allows 6 digital cars to race at a time. 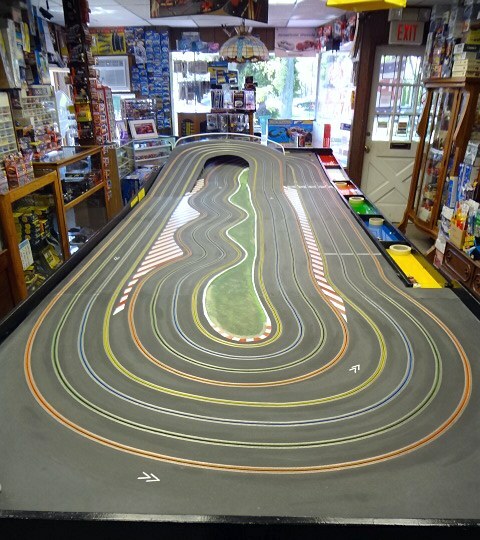 We had this track up at different times during the race season and had 3 Scalextric high impact car races and two specialty races, the first being a 500 lap team NASCAR event and the second a Scalextric GT race. The 1/32 season runs from Labor Day weekend in the fall to the first weekend in March of the following year. See the race schedule for individual events.